Are We There Yet?? : It's a Miracle!! Definitely not something I thought I would be seeing again anytime soon - especially here in Connecticut where gas taxes are HUGE! I have that photo! weird. GREAT MINDS THINK ALIKE! 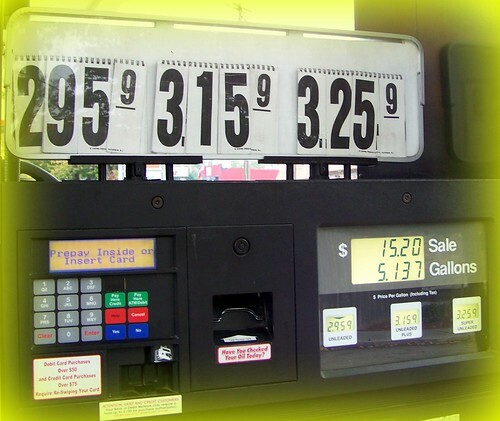 Ha ha ha ha...when I was walking to the apartment I saw I passed a gas station that was $2.95 like this and I took a picture of it and was going to post it for you! LOL...how funny. podunk was 2.74 today. what a relief! I don't even look any more. I drive into the gas station with a baseball cap on pulled down to my nose and feel my way around the petrol pump, gas nozzle and petrol cap. I can do it all by touch alone and I don't bother to wait for the receipt and I would certainly never read it as I wouldn't like to pass out on the forecourt! 3.03 in Oregon dang and that is at Costco cheapest gas in town..
Just think, about a month ago, gas here was hovering around $4.00 a gallon. Yesterday, before we left for Pittsburgh, we got gas here and it around $2.85-2.90 a gallon. Coming home, we stopped about half-way home and filled the tank again and the price at that station was $2.72 a gallon. I've heard that some places a little east of here, it is even cheaper -like around $2.50 or so. Hope that price continues to drop and makes its way to my neck of the woods -SOON! Who knew we could get this kind of positive benefit from the financial crisis? OK, I'm hunting for that meme you taggedd me for waay back when....where is it anyway. I had to stop and laugh at this post yesterday gas was 1.63 a gallon regular....what a wild ride!